If you've been on the hunt for the best Halloween costume ever, it's time to pack it up and try again next year. Because we're pretty sure that prize should go to this pug. 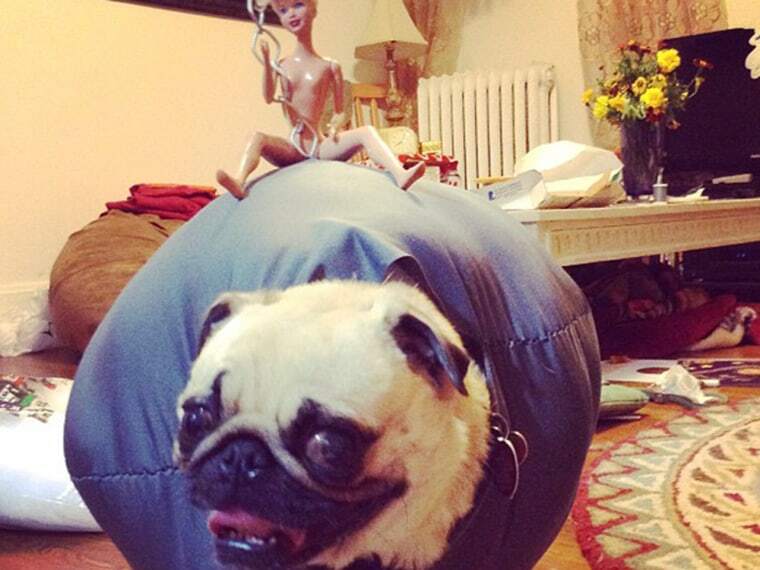 While there will be no shortage of Miley Cyrus-inspired costumes this year, it will be hard to top this canine "Wrecking Ball" costume, complete with a lumpy rock suit and a Barbie doll in the buff. McKenna Ihde submitted the photo of her pet Tottie to Petco's Make a Scene Photo Contest, where it had already racked up over 800 votes by early Tuesday afternoon. But Tottie faces some stiff competition from another pug, Susie, dressed up in a hot pink wig and magenta necklace. Voting closes on Oct. 27, so Tottie has just five days left to wreck the competition and seize the $25,000 grand prize. If you're feeling a little costume-envy, Ihde's cousin has a blog with step-by-step instructions for making your own "Wrecking Ball" costume for your dog. And just in case you're interested in another animal-oriented parody of the now infamous Cyrus video, here's a hedgehog version (and yes, the little guy is very good at those awkward tongue moves).